Students outside of St. Joseph’s Academy in Downtown Orlando, Florida. In 1889, St. Joseph’s Academy was constructed on the church grounds of St. James Catholic Church. 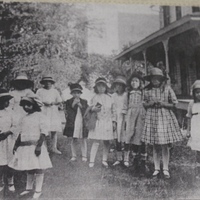 The Catholic school was administrated by the Sisters of St. Joseph. The school began with 30 students and the student body peaked in 1927 with 200 pupils in attendance. In 1928, Father Michael Fox began construction of a new, larger school nearby and closed the academy in 1929. Original 5 x 8 inch black and white photograph: Orlando Remembered Exhibit, Downtown Orlando Post Office, Downtown Orlando, Florida. Digital reproduction of original 5 x 8 inch black and white photograph. St. James Catholic School. Our History and Development. 2015. http://www.stjcs.com/index.cfm?pID=5723 (accessed November 6, 2015). "St. James Cathedral School." K12 Academics. http://www.k12academics.com/national-directories/catholic-school/st-james-cathedral-school#.Vi-JRX6rTGh. “St. Joseph's Academy Students.” RICHES of Central Florida accessed April 26, 2019, https://richesmi.cah.ucf.edu/omeka/items/show/5560.